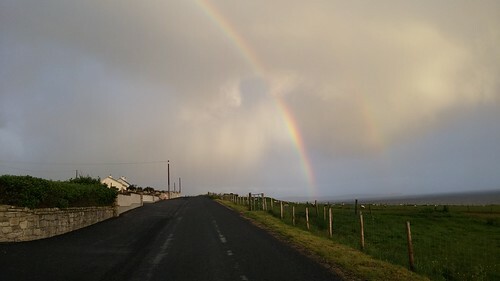 Awakening to constant rain it was another slow start at 5am on the bike, 2 miles down a valley and straight into the Glengesh (Ras Dhun na nGall) I was cold and wet, sweating in a waterproof and at 11% this was hurting my stiff cold muscles and bones. 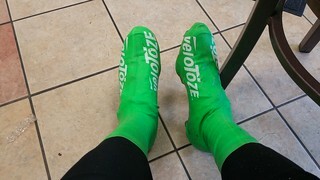 This mornings ride was the low point of the trip, constant rollers drained me as I dragged my body over 50 miles in 5 hrs moving time, this was slow. Mentally I craved a hot breakfast, the views were still great but the camera stayed locked away from the wet. Brief relief finally came in Killibegs with the first open store. A coffee machine some sandwiches and allowed to shelter indoors whilst chatting with the friendly staff soon restored my mental state. Approaching Donegal brought the start of many a view to come, seeing the coast and mountains ahead across expanses of water. 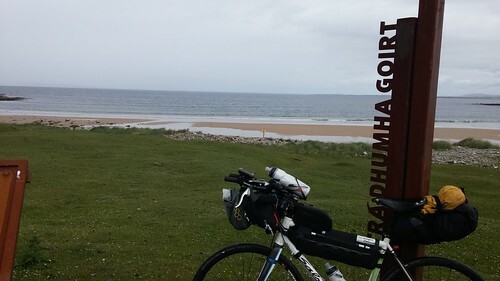 Great to see where you were about to explore, or the fantastic coast you had ridden hours before, but mentally tough, riding so far but not appearing to go anywhere. The rain came with a vengeance just as I hit Ballyshannon and the main N15 road, frankly it was hell. Close passing traffic with face breaking wind driven heavy rain, today everything was getting wet. My waterproofs are good and it wasn’t cold, and the saviour was cosy feet in my country sympathetic rubber booties, I remained cheerful and kept moving forward. 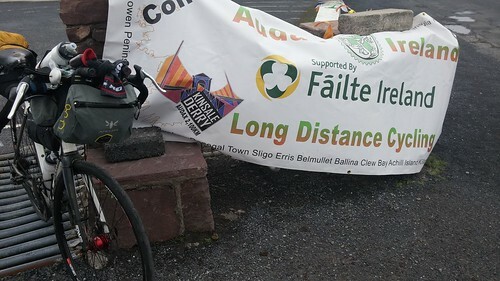 Through Sligo going round Strandhill was a brief rest bite from the strongest headwinds yet, but it didn’t last long. I promised myself a big Fish n Chip supper to keep me focussed and a perfect rest and dry off stop appeared at the perfect time. The river Estuary at Ballina, a sit down chippy where I raided the paper towels drying myself and kit and relaxing ready for a big push into the night again. 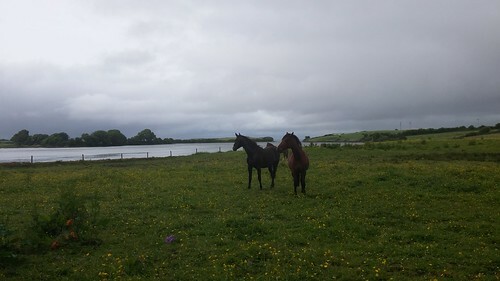 The heavy rain had subsided and even brought some great views of the estuary of horses grazing by the sea, even if the minute I stopped they moved and ruined the perfect pose they had. 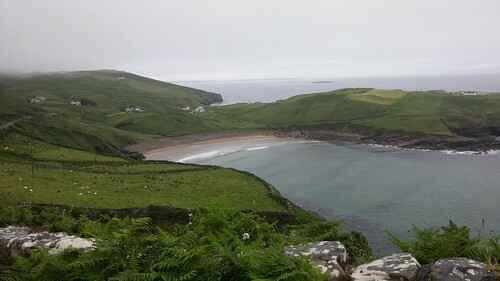 Oh joy going back up the estuary was North Westerly, that killer wind was now an aid,helping me digest the big meal, I’m not sure what this peninsula of Co. Sligo is called but is started to rise to a plateau high above the Atlantic Ocean. Racers will remember it due to the Glass Pyramid of the Céide Fields Visitor Centre perched on the hillside, all I remember is thinking I’m going to get stuck out here in this isolated wild exposed location with the promise of more rain. My resolve broke, I desperately searched a few derelict buildings for at least a small portion of roof to offer shelter, a broken man. After a comedy moment when I looked in the doorway of one old house, only to have about 20 sheep panic and jump over my thigh in a frantic escape, I found my bivy for the night. 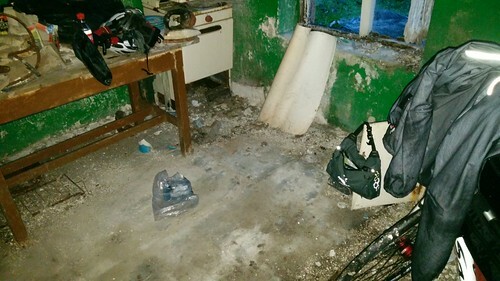 It had an old door, a well serviced kitchen and the first floor looked like it would not collapse at least for one night, I hoped. 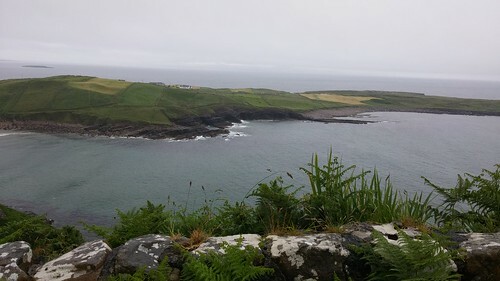 It was dry and dusty, and had a picture window view, and amazingly the big stone walls deaded all the howling wind noise and I had a lovely peaceful nights rest. Despite the very slow body breaking start, the day finished strong and on the worst day for weather I can be happy with 181 miles, another 17hr day but at only 12.4 mph a wind affected moving average. Race News: A race defining day, leader Bernd Paul approached the Achill Islands loops with a healthy lead, and completely missed them out! that’s a significant portion of the course. I hadn’t realized it was that blatant, navigation is a big part of these challenges, surely that is a DNF from the overall result from that moment on. Mike Henley had crashed ripping off his rear mech and was reported waiting for a shop to open in Ballina on Monday morning to affect repairs. Dismissing BP, Daniel now took the lead 2pm Sunday, with John and Adrian chasing him down. Daniel called it early at 6pm and John then regained the lead, but then Adrian rode later claiming it himself. Daniel got going again overnight and was finally our leader going into day 4. Out from my cosy shack back into the rain at 5am, I really must pack up quicker, wasting a precious hour slowly getting going from awakening. this part of the day is certainly easier in sunnier climes. 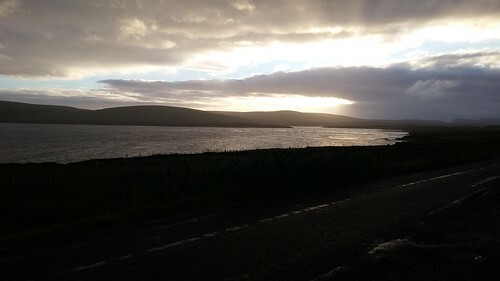 The initial ride along the Glenamoy Estuary was spectacular, amazing sunrise and rainbows highlighting that the sun was trying to fight through the squalls. Yesterday had been a long lonely day, I hadn’t seen another racer all day even though it transpires we were pretty close and passing each other stealthily on the same route. Another slow start but eventually the waterproofs came off and running low on reserves a supermarket deli in Bangor came to the rescue. 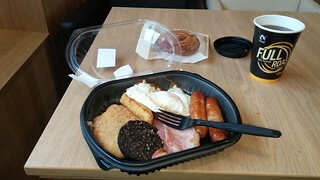 I didn’t rush, a full breakfast and once again sorting out the wet stuff, including drying out my cash. I’d foolishly arrived in Ireland having forgotten any back up plastic. I had plenty of Euros but was limited to a 30 Euro a day budget to survive the trip without searching out emergency money. Checking the tracker, I didn’t even register what was going on, just that mine hadn’t moved today. Changing the batteries it appeared ok but they were duff and later failed, foolishly I had set up the low battery alert it can give to email me. To save data costs I never checked emails, Note to self reset this to send me a warning text in future. No apologies for yet another food picture, but it really was a life saver, The hot deli’s in shops and garages here are brilliant, can we import them into the UK please. I stopped here so long maybe I secretly desired another racer to drop in for some company, I’m glad I didn’t realise how close the race up front had become. 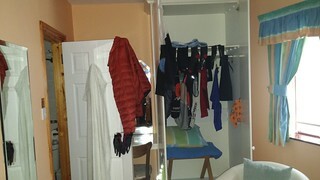 I was dirty smelly and drained by the battle against the elements, even a good wash in the washroom didn’t help, I had already decided today was a shower and soft warm bed day. 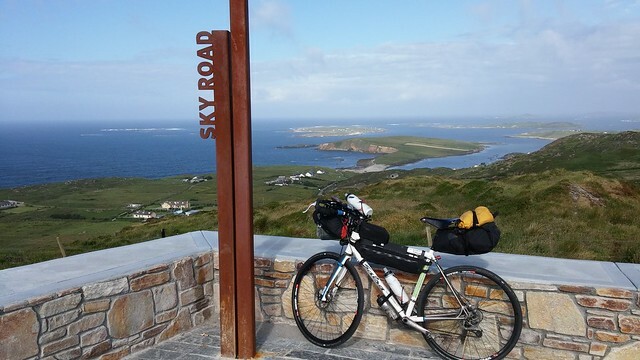 Three hours later riding over the bridge onto Achill Island the mood was rising, the sun was out and the views were stunning. I’d noted how complicated this section was with three separate loops and made sure there were waypoints on my mapping specifically telling me to take the right turns. Sea over the right shoulder, simples. It looked tough with bit lumps rising from sea level all around, but my mind was in a happier place. 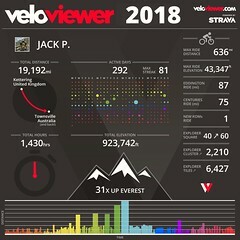 I was going to enjoy this in a relaxed style, this is my holiday and the race along with my daily 200 mile target can take an even bigger step back. 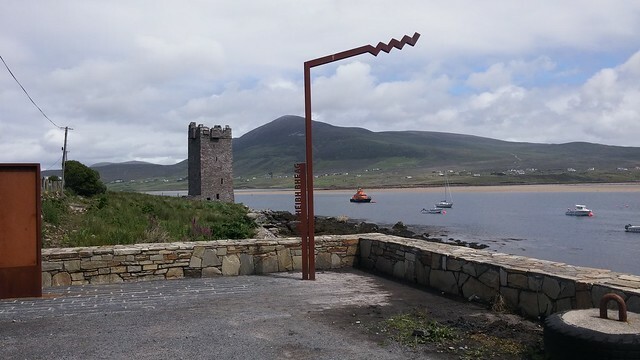 Achill Island was an unsung hero of this trip, there was no mention of it before, but I’m sure I will be back one day it was glorious. life was good again. At one point though I did switch off, a short steep climb in a quiet valley was lined with big inviting roadside rocks. Stripping off eternally wet socks and getting some air while sunbathing was a simple pleasure missed with this chase for miles, should have done this earlier on the beach above. Just before the start of loop three I ran headfirst into organiser Adrian, confused he explained how it was doing the final loops backwards by mistake. He filled me in on apparent carnage through the field, riders were dropping like flies with mechanicals and strained bodies, he too was finding this tough. Hearing this from a guy who has churned out constant 250 miles days on races before certainly helped my mental state as we parted going separate directions. 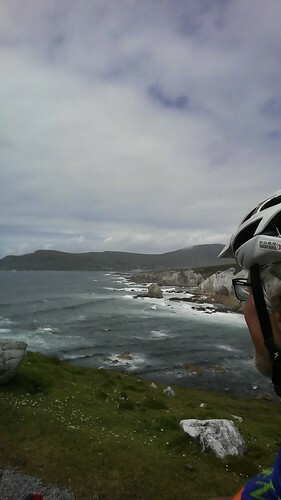 Climbing a 10% hairpin strewn coastal climb, brilliant blue sea crashing off the shore below, just had to captured with a selfie. I was loving this again, pressure off, sun out and even cheering spectators. Maybe they were just baying for a one handed wobbly cyclist to fall off, in England maybe but here everyone was so friendly and supportive of your endeavours. Three loops down, took me a touristy four hours and it was again time for a supermarket deli hit. Huge hot Sausage baguettes enjoyed talking to some French tourists who were filling me in on the delights of the extensive Green way cycle trail here which shows off the surrounding area in safe tranquillity. 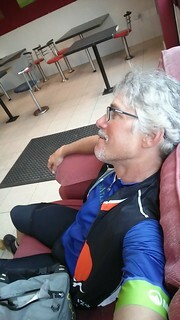 I was eating well, resigned to a short day, happy that my legs still felt great after hearing of the troubles of other riders. 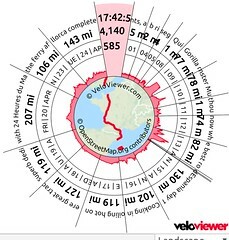 Thinking of how some must be grinding low cadences up the unforgiving climbs I set myself a target to scale every climb without stopping, even for photos. Then George popped up. Looking cool he was just starting the Island and it was great to have time to chat, I was surprised I was behind him but he too was suffering after breaking a front mech and punishing his legs up the climbs in high gears his full story is blogged here. Riding off I waved at a rider as I peeled off a junction, little did I to know it but I would meet Stephen Haines properly later in the race. Heading off to Newport I first passed one of the rest points for the Wild Atlantic Audax which was going the other way on most of this route. I didn’t pop my head in but it appears others did and were gladly received and assisted if required. They certainly had put a lot into the organization, far removed from our nomadic ride, but I’m insanely jealous of their steel lazer cut finishers trophies. Not long after I met their leader on the road, we chatted, he had started with a straight 40 hour session, their a tough lot Audaxers. My day ended in Westport, a non serious race day of only 126 miles barely 12 hrs after it had begun. A pint of Guinness at McCarthy Bar; well it had to be it’s part of discovering Ireland. 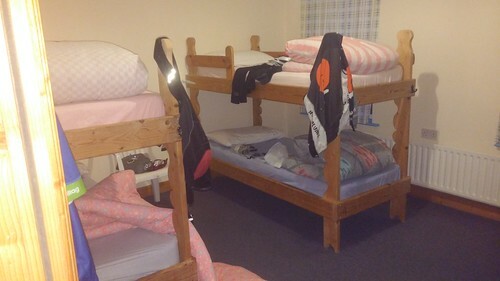 The room was huge with 3 beds, maybe I should have hung out a sign for fellow racers. Time for washing, breathing and airing, a total reset. During a food forage, Paula passed me on the street, we chatted her surprised to see me again, I told her to go for it expecting her to get a good four hour march on me. She told me my tracker was still faulty, In non race mode I never checked the tracker, if I had I would have seen Adrian had also stopped round the corner, we could have shared a pint. New batteries and I was back in view to all again for tomorrow. 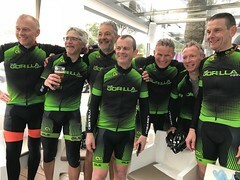 Race News: MN scratched, Mike was repaired and back flying through the field again; by 1am he was back up to 4th Daniel left Achill Island with John hot on his heels but appeared to be suffering as JS took a commanding lead for the first time. Paula and Daniel ended up together at Tullycross with Stephen Haines moving up to 5th. George and Michael Hampl passed the snoozing JP and Adrian. 3 am engage tracker, off into the dawn no excuses today it had to be a 200 day. Little did I know JS was up and running early too, while MH was making up for lost time. The rain and wind soon started again as again I tracked an invisible NW coast. 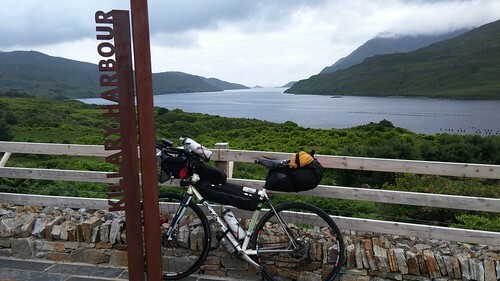 Several nods to late night Audaxers heading for their open all hours support crew, they have a time limit after which they are deemed a failure; in the Transatlantic Way Race if you follow the route you can’t fail to be successful. Turning South through the Dhulough Pass the views of Doo Lough (Black lake) nestling in between towering peaks was breath taking. 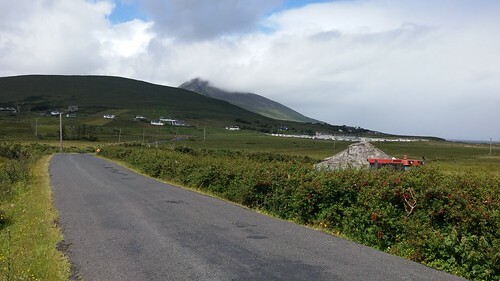 There was no chance of a photo I could barely pedal downhill at this point, luckily the super strong winds seemed to only be channelled through the pass, and it became easier round Kilary Harbour on a seemingly endless loop of fine road. This was a great start to the day but after five hours at Cleggan, with the sun out I was hoping for a break. There’s a ferry here to the settlement on Inisbofin Island, apparently travellers don’t have the luxury of a café, a quick cake from the shop had to do. I couldn’t help imagining places Paula might have stopped last night as she forged ahead not realising she was already more miles ahead having stopped here too. This section of coastline was one of my favourites of the whole trip, The Sky Road climbs as it darts in and out of the coastline, huge bens inland and breathtaking views of the islands (Inishturk and Turbot) in a clear blue sea. A fantastic morning’s ride down to the bustling town of Clifden. 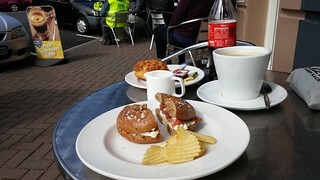 At last a chance to sit outside in the sun watching local life enjoying chatting with Dutch cycle tourers over a great coffee with surprisingly good breakfast bagel. It surprised me when just as I was getting ready to leave Stephen Haines rolled into town. Of course many riders could have passed after my long layup yesterday, but it was a reminder that I had effectively thrown four hours away. After introductions and updates on rider status that we knew of I left, but I now had a new shadow that was to last the day. Setting off I decided to stick to a routine, 3 hrs solid on the bike then a food stop. Sandwiches and coffee at a supermarket with a nice view, and who should slot into my view as I left, SH. Resisting the chase I was pleased to eventually catch him, he looked laboured not pedalling comfortably, after a few words I expected that to be it. Spurred on though he caught up and we rode for some time chatting. Then as if by magic the media van appeared, the film crew flung open the rear doors and we gave interviews on the move with Matthias (his photos) firing off shots hanging out the front. At this point I became conscious that the pace had increased on the rough roads trying to ride and talk, and my ankle strangely started to ache. Stopping to pee I left Stephen to carry on to Galway where we both expected to stop for food. The main R336 to Galway and the subsequent trip across town was horrible, roads I would never travel by choice maybe reflecting the fact this is essentially designed as a driving route. By the look of the roads we’d luckily just missed a downpour, and after the equally busy N18 it was Fish n Chip time again at Ballinderreen. The service was slow but the sofa was comfortable and N.Ireland in the Euros provided some entertainment. 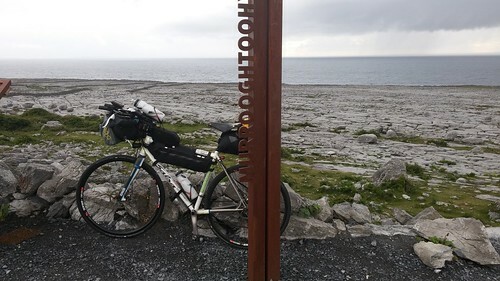 Happy at 175 miles I set off into the dusk aiming to put as much of a dent into the trip moving into County Clare towards the Cliffs of Mohar. The stop allowed my ankle to seize up and it was slow going for a while, the bay at Ballyvaughan looked a nice stop for any other day. The coastline then turned into a moonscape, stunning Limestone pavements and pure rock cliffs and beaches of amazing regular patterns, . Here it was calm and progress was good, but on rounding the headland is was another story, yet more draining headwinds, oh joy! We both alarmingly compared swollen ankles whilst making separate plans to get up at different times, the race was not between us. 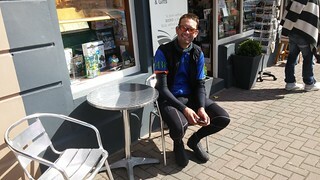 At last a day had gone to plan, 209 miles at nearly 19 hours on the road, tons of climbing too. 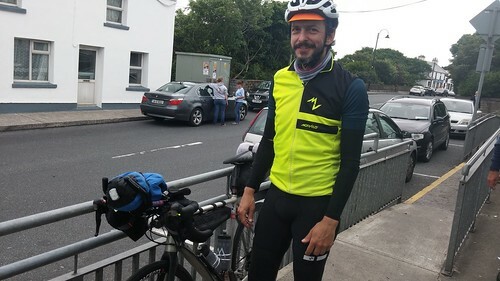 Race News: Riding all night Mike took the lead back from John before Galway bay at 9am and made the Ferry at 7pm before ploughing on. John managed the last 9pm sailing before resting up in Tarbet both with a big advantage now. Paula had an epic day getting into 3rd stopping at Spanish point within easy reach of the ferry. Daniel in 4th with JP and SH in their cosy hostel in 5th. Adrian had dropped back and was still in Galway with George, The media car lay in wait at the ferry for the mornings rush. BP was down in Killarney well round the Ring of Kerry.